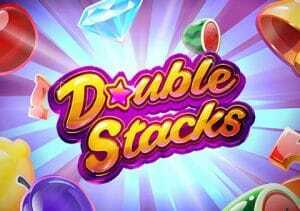 NetEnt is the latest developer to try and spice up the classic fruit machine in Double Stacks. This polished blast from the past is played using a 5 reel, 10 payline game engine and comes with double symbols that give the potential for 10 in a row combinations. Also boosting your winning chances is a Free Spins feature that awards up to 60 free spins. Play on your computer, tablet or mobile from between 10p and £200 per spin. There’s a glossy feel to the design of Double Stacks. On the colourful reels you’ll see melons, lemons, plums and cherries as well as more rewarding bells, bars, sevens and diamonds. There’s also a wild. It’s as bright and bold as you’d expect from a NetEnt game with this theme. The quartet of better paying symbols can spin in full stacks and fill whole reels. When they do, the symbols will expand and now count as double. This means you can land 6, 7, 8, 9 or even 10 in a row combinations with payouts to match. Land 5 of the top paying diamond and you’ll pocket just 9 times your bet. A 10 in line combination awards 100 times your bet! Above the reels you’ll see the maximum possible payout from each of the 4 higher value symbols. Fill the screen with double diamonds and a massive payout of 1,000 times your bet is on offer. Land 3 or more scatters on the same spin to activate the Free Spins feature. On offer are 5, 15 or 30 free spins. The double stacks can strike in the feature as well as during the base game. Hope to see at least 2 or more scatters land on the same free spin as this will add even more free spins to your total with 60 available altogether. NetEnt has done a pretty good job with Double Stacks – the design impresses and the gameplay, though simple, has the potential to deliver some pretty tasty action. If you’re a fan of classic fruit machines with the odd modern day extra thrown in, then Double Stacks should offer plenty of appeal. If you’re looking for bigger win potential, NetEnt has plenty of alternatives including the iconic Dead or Alive or the vampire-inspired Blood Suckers II.